Tropical paradise is not necessarily the first thing that springs to mind when thinking of Japan. But the islands of Okinawa rank right up there with some of the most sybaritic places in the world. Inhabiting an archipelago stretching out from the island of Kyushu towards Taiwan and the Philippines, Okinawa’s inhabited islands (there are hundreds of islands stretching more than 1000 kilometres) are grouped into three smaller archipelagos – Okinawa Islands, Miyako Islands and Yaeyama Islands – and boast a sub-tropical climate, as well as a rich culture that is completely unique within Japan. The Ryukyu kingdom was a thriving dynasty spanning hundreds of years (15th – 19th century); while most of mainland Japan was living as an insular feudal society under the protection of the shogun, it was trading goods and knowledge with China to the west. Okinawa was only really brought into the fold after the Meiji restoration of 1868, which ended the powerful Tokugawa shogunate that had ruled Japan for some 250 years and returned imperial rule to the country under Emperor Meiji. Island-hopping in Okinawa is a brilliantly easy pursuit, aided by regular inter-island flights and efficient ferry services. The obvious place to start is Okinawa Island, the biggest island in the group. Flights swoosh in and out of Naha Airport from the rest of Japan regularly throughout the day. While Naha, located in the south of Okinawa Island, is the capital of the prefecture, it lacks the frenetic bustle that is a characteristic of cities like Tokyo. Its gentle pace is a treat; walking the streets you’ll notice locals in aloha shirts, known locally as Kariyushi shirts, and shops selling interesting dishes influenced by Okinawa’s historic trade with China and the continued presence of US armed forces (Spam, anyone?). Shuri Castle is a hulking, exquisitely bright rendering, with both Japanese and Chinese decorative influences including carved dragons. Delve into Okinawa’s Ryukyu history as you take in the opulent throne room and the vast grounds. A visit to Peace Memorial Park in Itoman, the scene of the final Battle of Okinawa, brings the region’s more recent history into focus. It’s now a sprawling memorial to all who fell here during the Second World War, Japanese, Americans and British alike. The Flame of Peace at the heart of the memorial looks out to picturesque green cliffs and the ocean below; these were the suicide cliffs that civilians fearfully threw themselves off as the Americans approached in the final days of the war. The next stop should be Ishigaki, 444 kilometres south-west of Naha over the East China Sea. More of a tropical paradise than Okinawa Island, Ishigaki has a wistful holiday feel to it. Driving the roads away from the airport, the outlook is of lush tropical trees wrapped with flowering vines, so dense in places that they block out the sun. 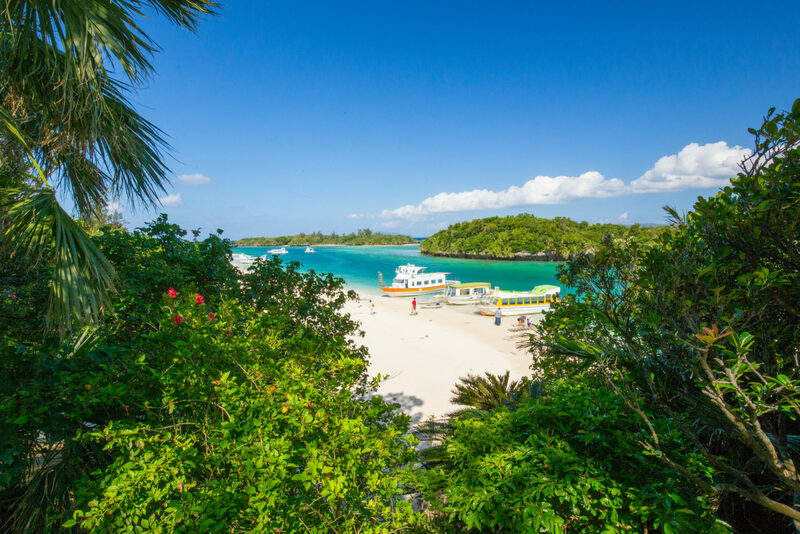 At the celebrated Kabira Bay the water is at its most potently blue when the sun shines; walk the soft sand and book a glass bottom boat cruise to gaze on the colourful aquatic world that exists just below the surface. For those who want to get a bit closer to the action, the reefs just off Ishigaki are filled with a curious array of fish that are best seen with a snorkel and flippers. The ferry ride to Taketomi Island takes just 10 minutes from Ishigaki, but feels a world away. Most of the roads here are made up of sand and crushed coral; all concessions to the modern world melt away as you navigate narrow laneways of traditional Ryukyu houses that hide behind walls made from stacked coral and drenched in flowering bougainvillea. Apart from the bullock carts that transport day-trippers, bike is the preferred method of transport on the island. Riding around the village you will pass Kihōin, Japan’s southernmost temple, a tiny little affair that is made more interesting by its collection of some 3000 artefacts accumulated by the priest. Cycling through lush landscape you’ll find yourself at any of the beaches that fringe the island. At Kondoi Beach, the silence is almost dense enough to touch, interrupted only intermittently by the sound of the ferry in the distance and the occasional fish broaching the surface. The shore is moody and blissfully deserted in the fading afternoon light. At Kaijihama Beach visitors gather to try their hand at finding miniscule grains of star-shaped sand, which are supposed to bring good luck. The ideal way to really indulge in the authenticity of Taketomi is by remaining after the day-trippers have left and staying in one of the small guesthouses that represent the only accommodation here. Iriomote boasts nature and wildlife in abundance, and is home to the southern-most national park in Japan. Yubu-jima is separated from Iriomote by a sand straight; head here to enjoy a traditional bullock cart ride. Miyako-jima, some 300 kilometres south-west of Okinawa Island offers up white sand beaches, great diving and snorkelling, historic sites and sacred places known as utaki, revered by Okinawans.